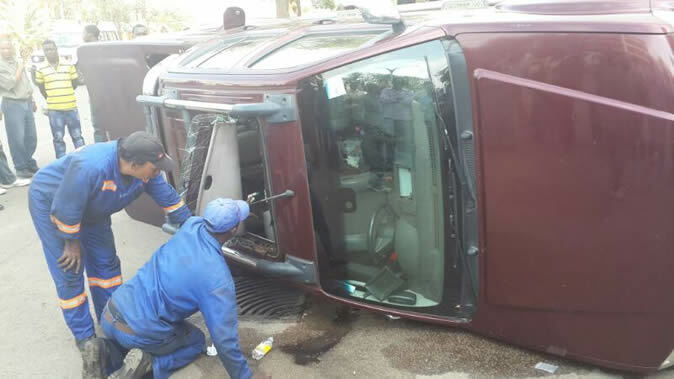 A vehicle belonging to Peter Ndlovu was involved in a near fatal accident in Bulawayo Thursday afternoon, ZimbabweFocus reported. The Navara, maroon in colour with South African registration was driven by Madinda Ndlovu' s daughter. The accident occurred at corner Leopold Takawira and Josiah Tongogara, adjacent to Mac’s Garage. The vehicle hit three vendors at Max Garage who escaped with injuries. An eyewitness who spoke to Radio Dialogue said: "The car was headed towards Tower Block when suddenly veered off the road and hit three vendors who were sitting on the pavement having lunch." He said the trio was then trapped under the vehicle. 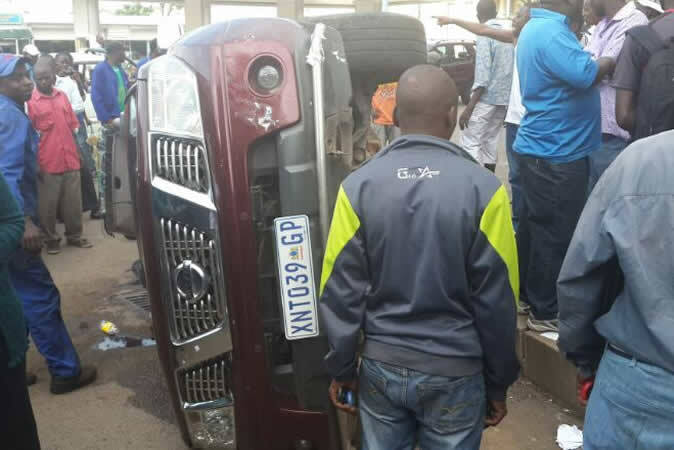 "They were trapped under there for some moments until onlookers came to the rescue and moved the vehicle to remove them," said the witness. He said the victims were later rushed to the United Bulawayo Hospitals (UBH), where they are reportedly in a serious condition. Bulawayo based photographer "Lucky Tshuma Photography t/a Images Unlimited" posted a photo onFacebook of the vehicle lying on its nearside.